Justin Bieber was pictured in Paris yesterday partaking in various activities surrounding Fashion Week Spring Summer 2015. The Canadian pop star attended the launch of Carine Roitfeld's CR Fashion Book issue No. 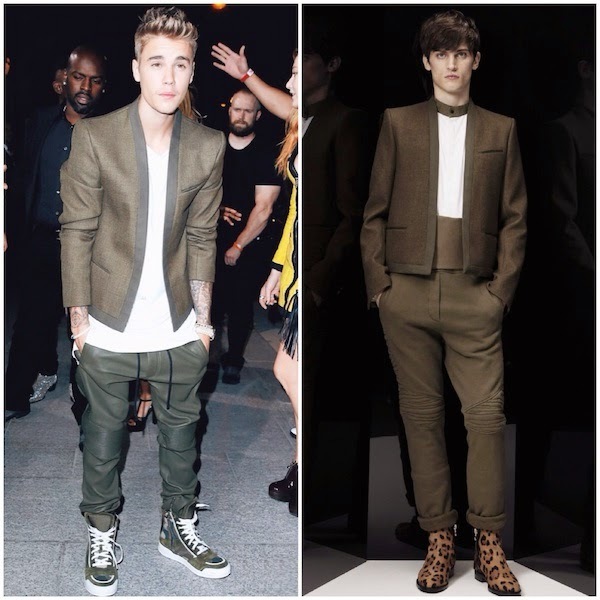 5 on 30th September 2014, and was pictured in a military green / khaki cropped jacket from Balmain Fall Winter 2014. Jared Leto wore a similar jacket in black and white back in January. Prior to attending the fashion book launch, Justin Bieber was also pictured on the streets of Paris in an animal print fur front leather varsity / bomber jacket from Saint Laurent by Hedi Slimane Fall Winter 2014. There is no doubt that Justin Bieber is hugely talented. The performer and song writer topped the charts at such a tender young age. While his fashion choices are often ridiculed, I think he just needs a bit of time, and a better stylist. To quote the venerable Britney Spears, "I'm not a girl, not yet a woman". In the same context, Justin Bieber who is 20 this year, falls into that category where it is just difficult to dress and cater for. Not exactly a style icon now, but Never Say Never. Well, he could always get style points from Harry Styles. Who´s the same age. Just saying.